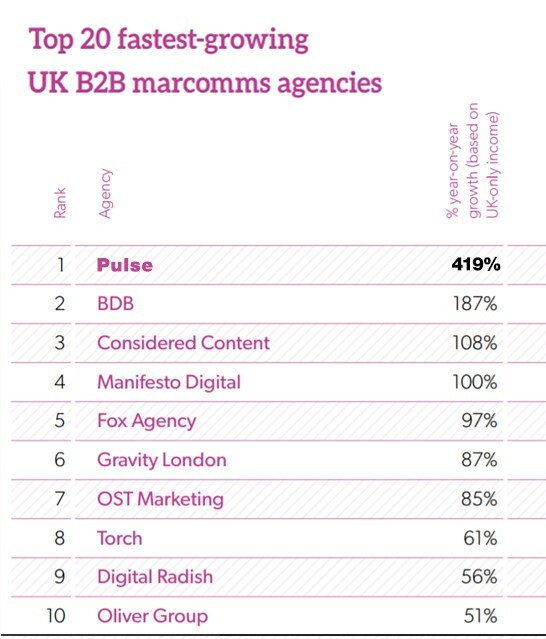 B2B Marketing’s annual Benchmarking Report recently verified Pulse as the number one fastest growing UK B2B Marcomms Agency! and truly gone, we thought we’d say a few words on how pleased we are with this prestigious accolade. It’s safe to say we’re very proud of our little achievement. It’s nice to have an industry benchmark for us to compare against for all the hard work and determination placed over the past 3 years. It’s also nice to see how we compare against some of our agency industry peers. accomplishments come from the successes we’ve had with our clients. We are incredibly grateful to each and every one of them for supporting us throughout our journey. Now we have more drive than ever to keep bettering our work, but more than that, we have the proof that our approach to marketing in this day and age is not only successful, but market leading.